This circuit features an intermittent siren output and automatic reset. It can be operated manually using a key-switch or a hidden switch; but it can also be wired to set itself automatically when you turn-off the ignition. 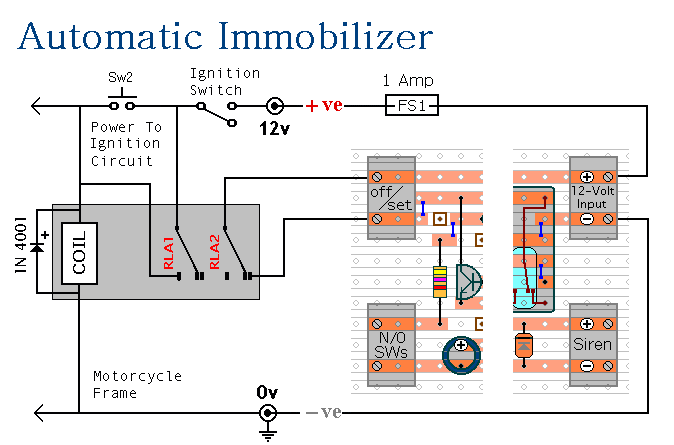 By adding external relays you can immobilize the bike, flash the lights etc. Ron has used my Asymmetric Timer as the basis for his design. Once activated, the rate at which the siren switches on and off is controlled by R7, R8 & C4. For example, increasing R7 will make the sound period longer; while increasing R8 gives longer silent periods. While at least one switch remains closed the siren will sound. About one minutes after all of the switches have been opened, the alarm will reset. How long it takes to switch off depends on the characteristics of the actual components used. You can adjust the time to suit your requirements by changing the value of R4 and/or C1. 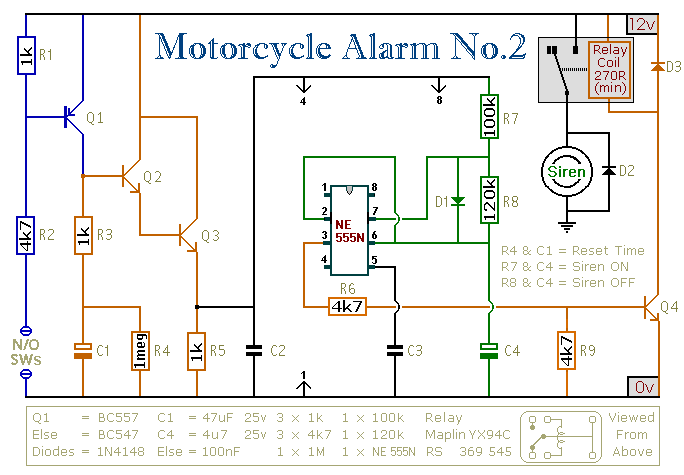 The Support material for this alarm includes a detailed guide to the construction of the circuit-board, a parts list, a complete circuit description and more. The circuit board and switches must be protected from the elements. Dampness or condensation will cause malfunction. 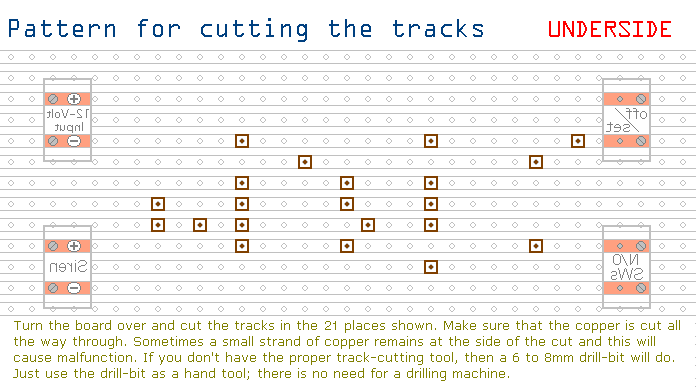 The components are all drawn lying flat on the board - but those connected between close or adjacent tracks are mounted standing upright. The links are bare copper wire on the component side. Two of the links must be fitted before the IC. A more detailed guide to the board's construction and a circuit description are available on request. You can use a key-switch or a hidden switch to set the alarm - or you could use the normally-closed contacts of a small relay. Wire the relay coil so that it's energized while the ignition is on. Then every time you turn the ignition off - the alarm will set itself. The quiescent (standby) current is virtually zero - so there is no drain on the battery. When you turn-off the ignition, the relay will de-energize and the first set of contacts (RLA1) will break the ignition circuit - automatically immobilizing the bike. The second set of contacts (RLA2) will turn-on the alarm. When the ignition is switched on again the relay will not energize. The bike's ignition circuit will remain broken; and the alarm will continue to protect the machine. You must press Sw2 to energize the relay. It then latches itself on using the first set of contacts (RLA1). The same set of contacts completes the connection to the ignition circuit; while the second set of contacts (RLA2) opens and switches off the alarm.